Scientists have had limited success at identifying specific inherited genes associated with prostate cancer, despite the fact that it is one of the most common non-skin cancers among men. Researchers at University of Utah Health studied prostate cancer patients with multiple cancer diagnoses, many who would not be recommended for genetic tests following current guidelines, to identify genetic mutations that may influence cancer treatment and cancer risk assessment for family members. Their findings are reported in the June issue of the journal Cancer. Pilié was part of a research team led by Kathleen Cooney, M.D., chair of the Department of Internal Medicine at U of U Health and a Huntsman Cancer Institute investigator, who proposed a strategy to identify germline mutations in men selected for the study based on their clinical history not their family history. The study was highly selective, including 102 patients who had been diagnosed with prostate cancer and at least one additional primary cancer, like melanoma, pancreatic cancer, testicular cancer, or Hodgkin lymphoma. The researchers examined the frequency of harmful germline mutations in this group of men. These mutations originate on either the egg or sperm and become incorporated into the DNA of every cell in the body of the resulting offspring. Using next generation sequencing, the researchers found that 11 percent of the patients had a disease-causing mutation in at least one cancer-predisposing gene, which suggests these genetic variations contributed to their prostate cancer. Cooney found no difference in cancer aggressiveness or age of diagnosis compared to patients without these mutations. 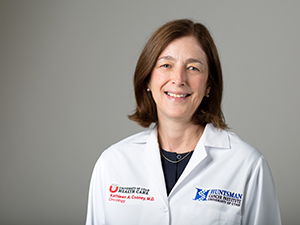 In addition, a certified genetic counselor and co-investigator Elena Stoffel, M.D., University of Michigan Comprehensive Cancer Center, reviewed personal and family histories from each patient to determine whether they would meet clinical genetic testing guidelines. The majority of the men in the study, 64 percent, did not meet current criteria to test for hereditary cancer based on personal and/or family history. The findings suggest that there are men with heritable prostate cancer-predisposing mutations that are not eligible for genetic screening under current guidelines. “This is the first paper in which we can show the potential of using a clinical history of multiple cancers, including prostate cancer, in a single individual to identify inherited germline mutations,” Cooney said. The majority of harmful mutations identified were in genes involved in DNA repair. “These mutations prevent the DNA from healing itself, which can lead to a predisposition for cancer,” Cooney said. This result is also beneficial because drugs like PARP [poly ADP ribose polymerase] inhibitors have a better success rate in treating cancers with the underlying gene mutation associated with DNA repair. Cooney cautions that this is a small pilot study rather than a broader epidemiological survey, and it consists of a highly specific subset of patients. “We cannot generalize these findings to the broader population, because we used highly selective criteria to tip us off to patients that may have mutations outside typical hereditary genetic patterns,” she said. The 102 patients included in the study were identified from the University of Michigan’s Prostate Cancer Genetics Project, which registers patients who are diagnosed with prostate cancer before age 55 or who have a first- or second-degree relative with prostate cancer. In addition, the research team identified patients from the University of Michigan’s Cancer Genetics Registry, which includes individuals with personal or family history suggestive of a hereditary risk of cancer. Future studies with larger sample sizes will include sequencing of tumors that will allow investigators to more carefully explore the different features associated with tumors that arise in individuals with germline mutations. “This approach will help us identify patients at greater risk for aggressive prostate cancer so they can seek earlier screening while pre-symptomatic,” Cooney said. In addition to University of Utah Health, collaborating institutions include University of Texas MD Anderson Cancer Center, University of Michigan Medical School and University of Michigan Comprehensive Cancer Center. This research was supported by a grant from the University of Michigan Prostate Cancer Specialized Program of Research Excellence (SPORE) and the University of Michigan Comprehensive Cancer Center Sequencing Core.